Since the first of the year, Berkeley County First Steps has received $6,100 from three companies and foundations to sustain and expand its early literacy and language development programs. The funds will benefit the Dollywood Imagination Library and Berkeley County Early Readers Fund. The Build a Bear Workshop Foundation contributed the largest grant – $5000 – for the Dollywood program. The Magnolia Foundation, the non-profit arm of Magnolia Plantation and Gardens, contributed $1000 for the Early Readers Fund. First Steps received $100 from the South Carolina Early Childhood Association (SCECA). Adrienne Troy-Frazier, Berkeley County First Steps executive director, said the money will help the agency expand the Imagination Library to the most rural areas of the county. The grants will help Berkeley First Steps address its current waitlist of children, she said. 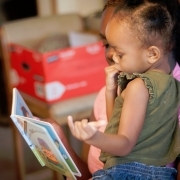 Build a community of readers who can model the importance of reading for the next generation. To make a tax-deductible contribution to Berkeley County First Steps Imagination Library and The Early Readers Fund call 843-863-3030. For more information, visit www.berkeleyfirststeps.org.